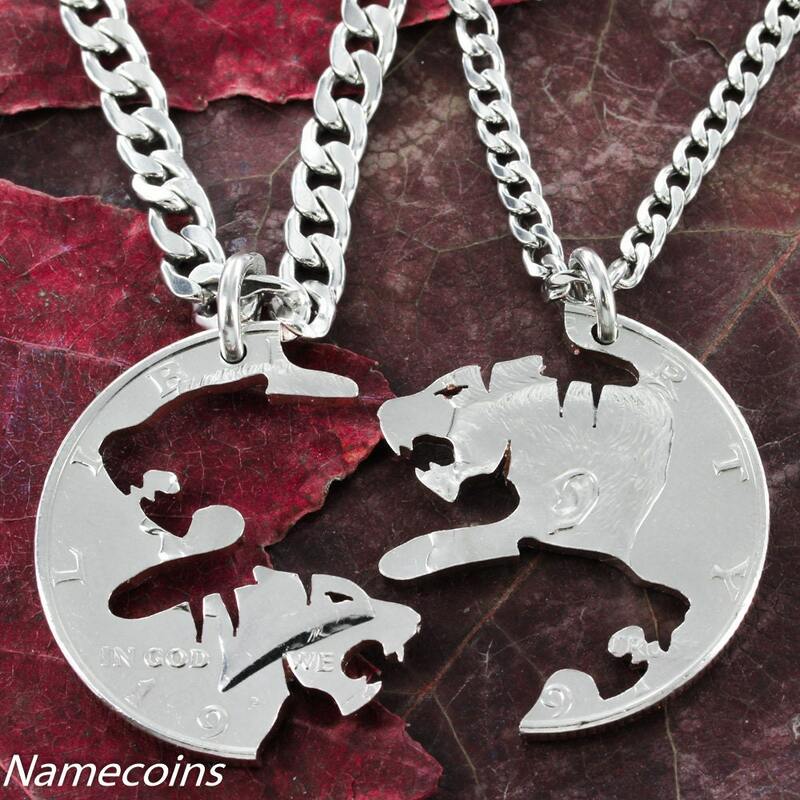 Tiger BFF Necklaces for 2, Best Friends or Couples Gifts, Boyfriend and Girlfriend Gift friendship necklaces, hand cut coin. This tiger necklace set interlocks perfectly only with its mate.Whether its for a friendship or a couple, our interlocking pieces are a great relationship gift. After all, you have to be close to even put the necklaces together :) They show that you are invested in the relationship and you would like people to view you as a pair. No two are alike because they are all cut individually by hand. You get two Quality Stainless Steel necklaces with each set. Or you can have one or both of them on key chains. I give a half to my hubby and half is for me :) thanks! I bought this for my best friend and I. It is stunning well polished and well made. I was worried about the little pieces catching and possibly breaking on clothes but its really strong and I haven't had a problem with it catching. the pieces fit together perfectly and it goes with anything, my friend and i absolutely love it, so unique and beautiful. My 11 year old son is in awe of this necklace he purchased for his friend. It's well made and shipped when expected.